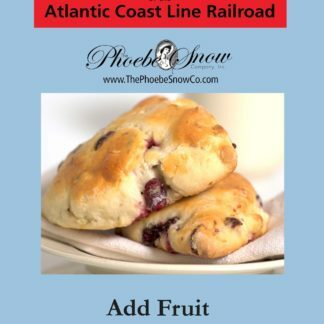 Blogs | Phoebe Snow Company Inc. 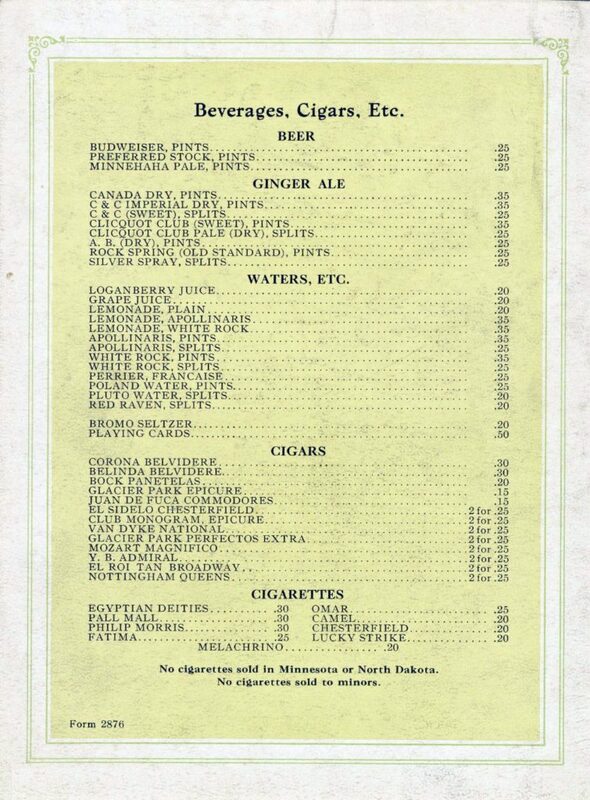 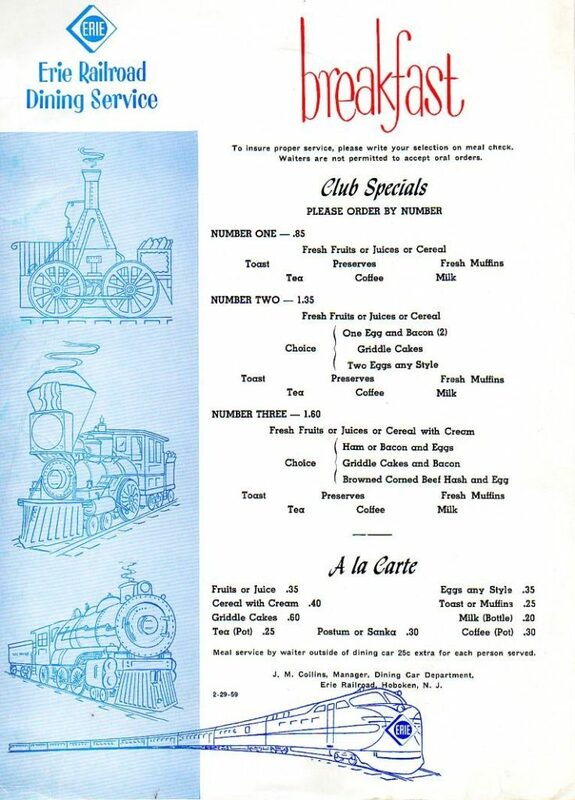 Since the Erie was probably the weakest competitor in the New York to Chicago market, it was forced to start offering dining car service fairly early to compete with the NYC, PRR and even the B&O. 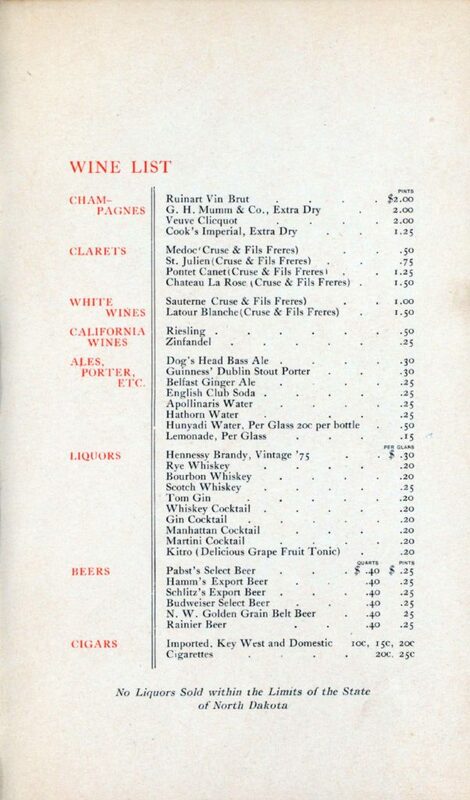 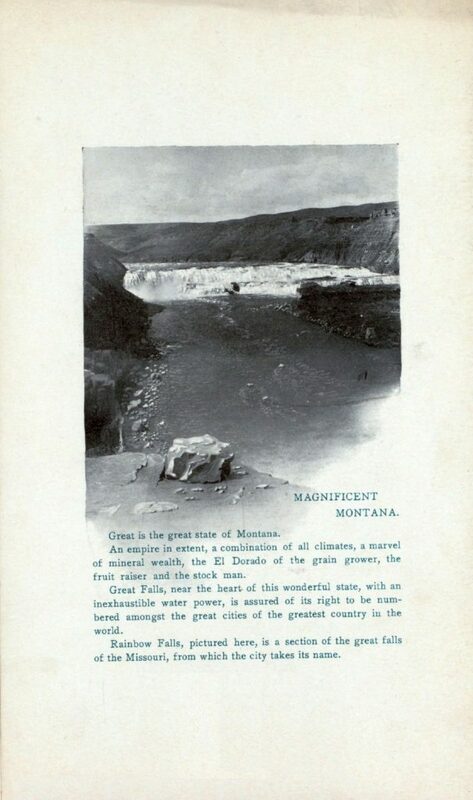 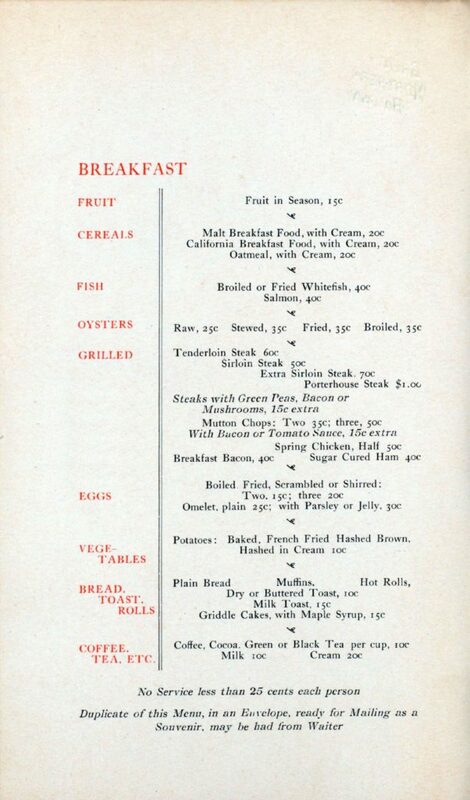 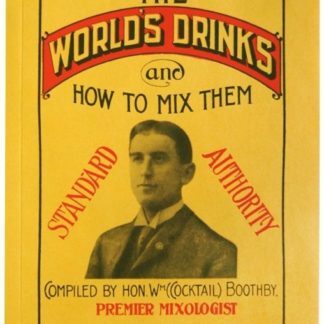 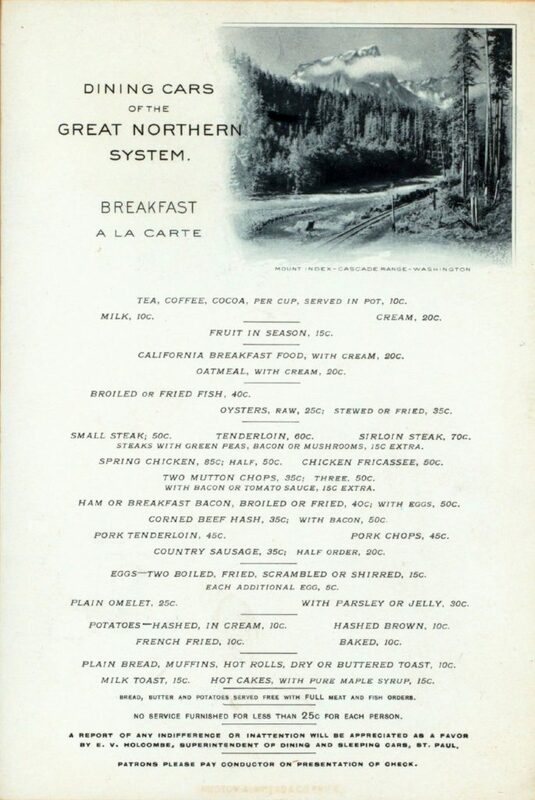 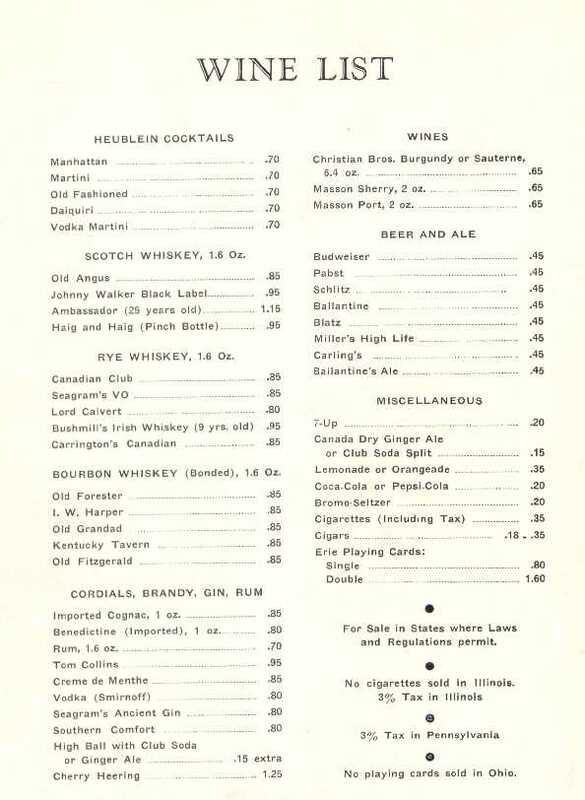 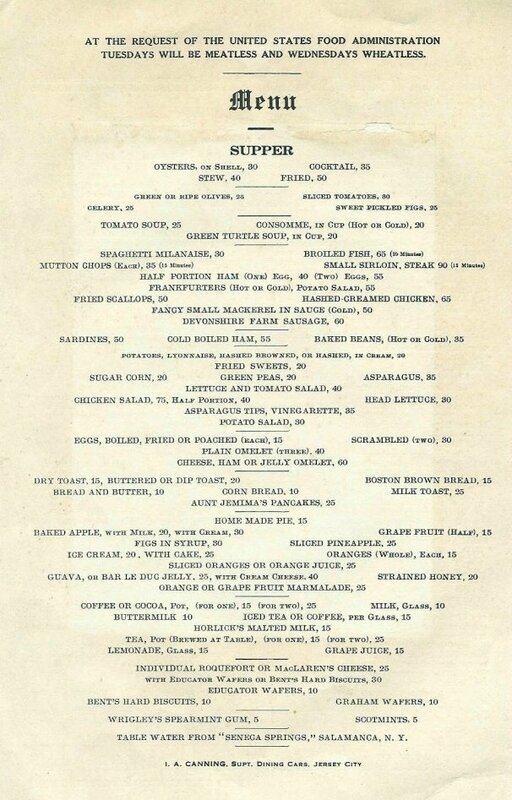 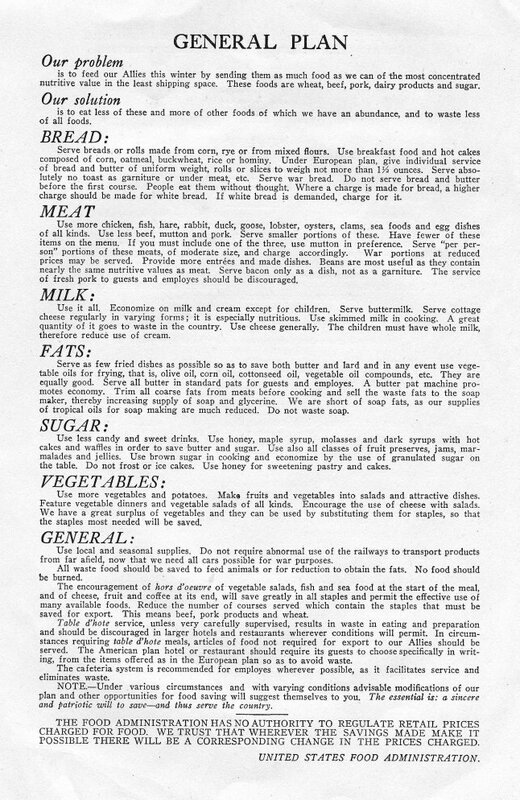 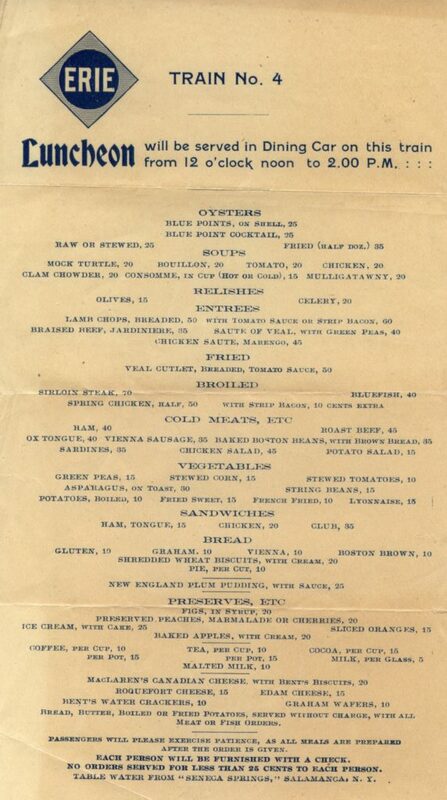 The early menus reflect that kind of high end dining experience. 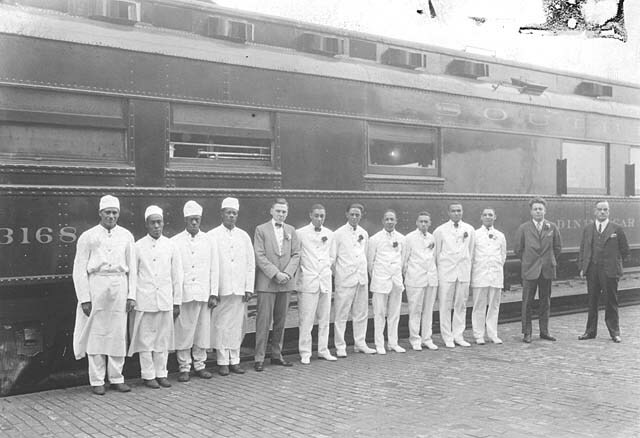 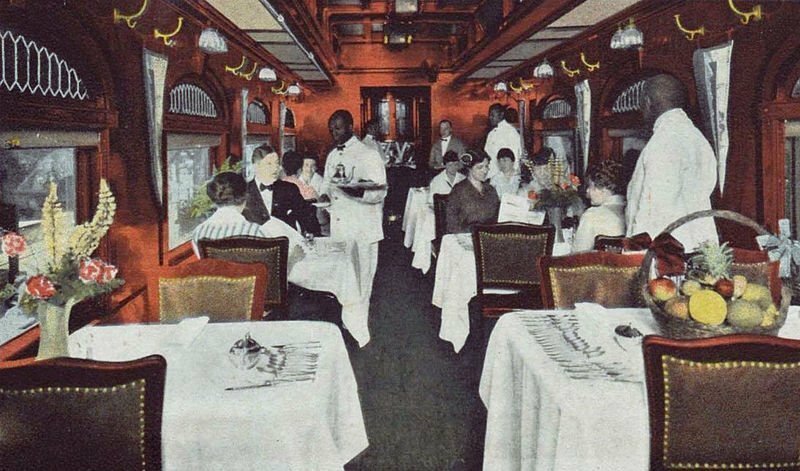 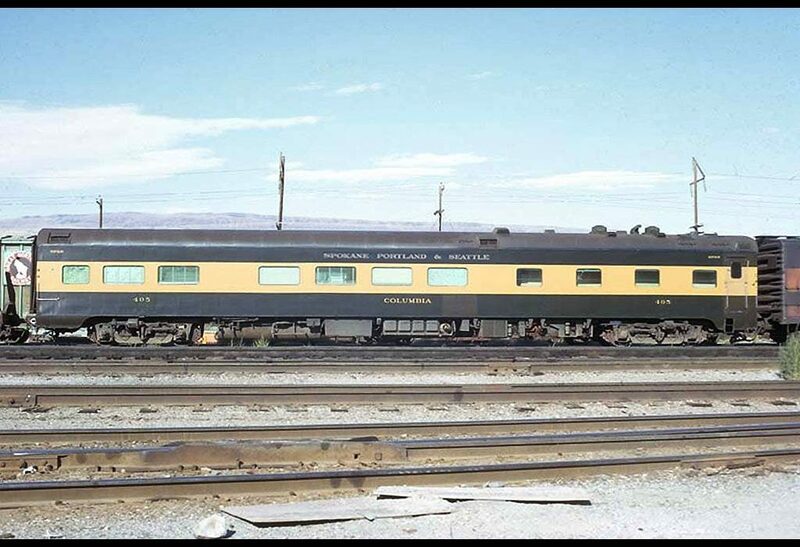 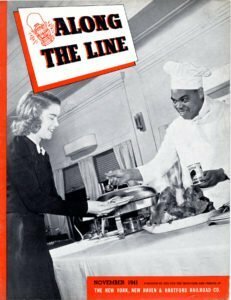 By the time of the Depression, the Erie’s dining cars more reflected the kind of passengers it served: not so much that New York to Chicago passenger but perhaps the Jamestown, NY to Marion, Ohio traveler. 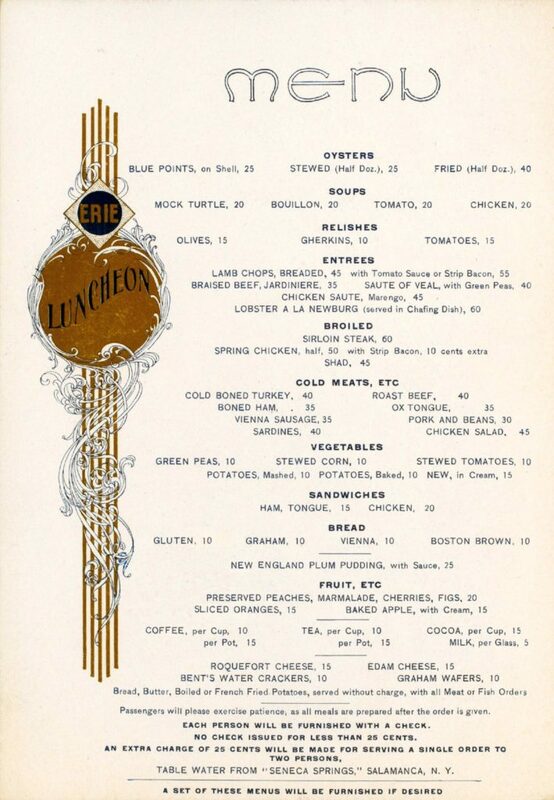 A meal on the Erie was more like Sunday dinner at home. 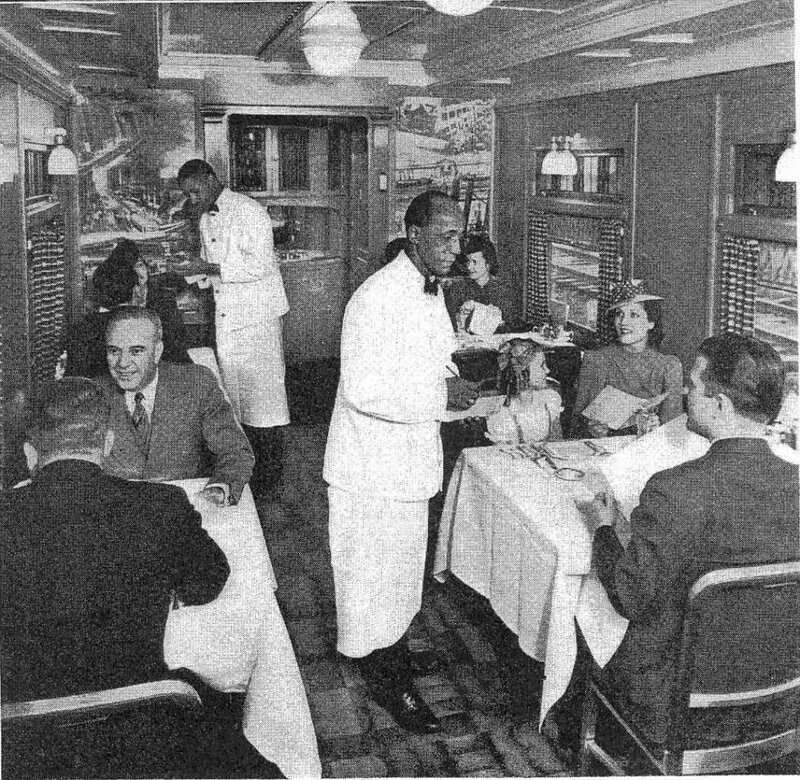 Erie diner in the 1940s. 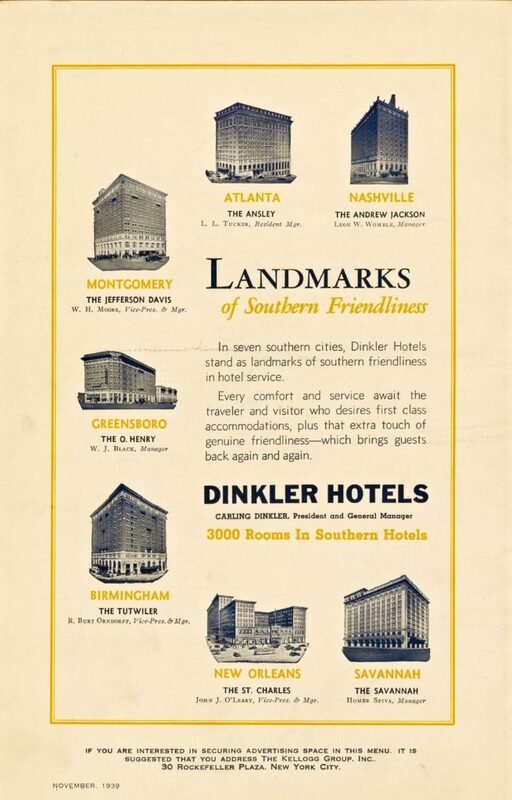 Publicity photo from the late 1950’s. 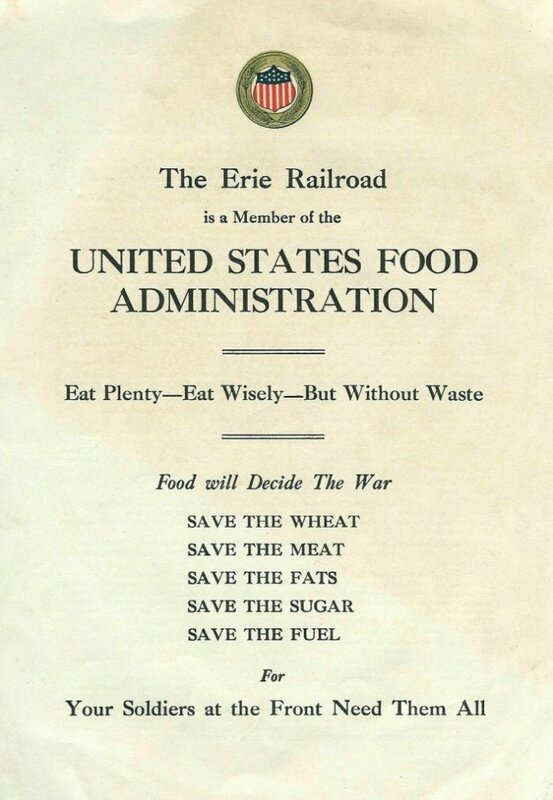 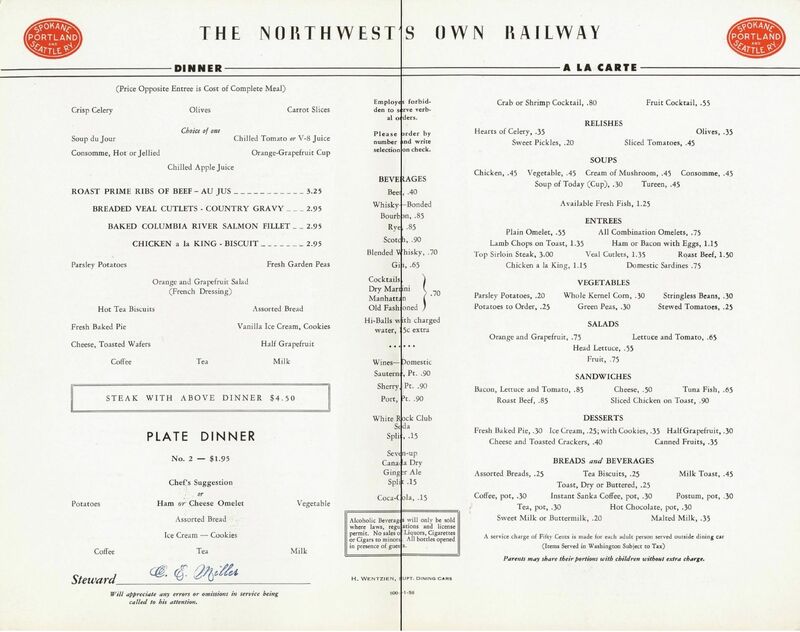 By this time, the dining car departments of the Erie and the Lackawanna were merged (before the railroads did). 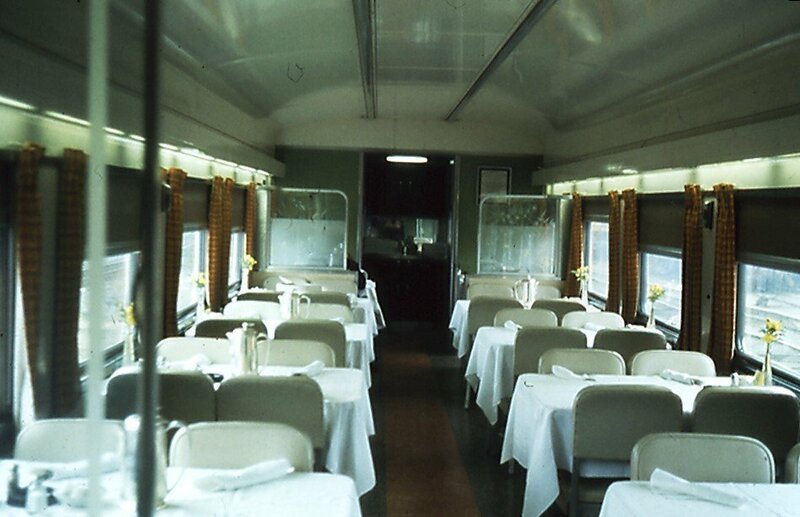 Here you see one the the Erie’s fleet of modernized (circa 1948) diners, using Lackawanna china! 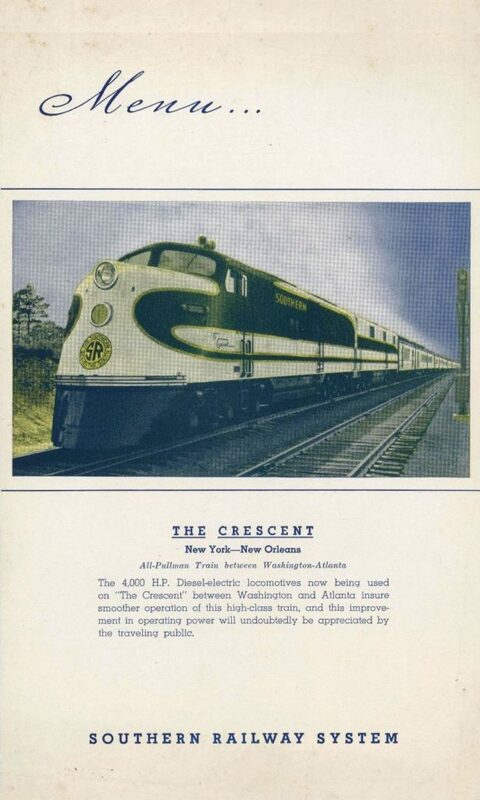 The “Starrucca” pattern was the standard used from the 1940’s until the EL merger. 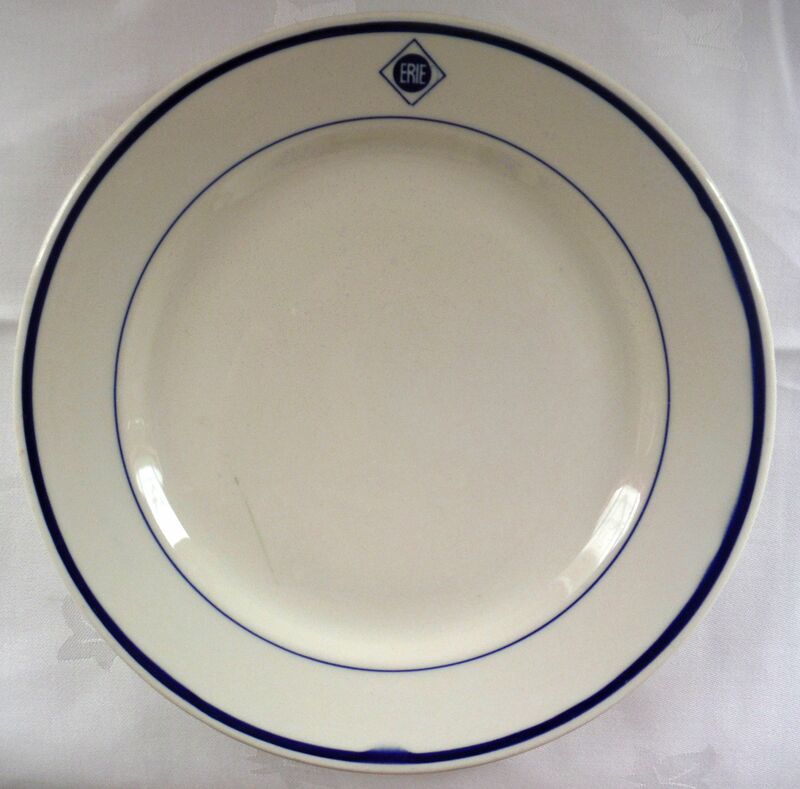 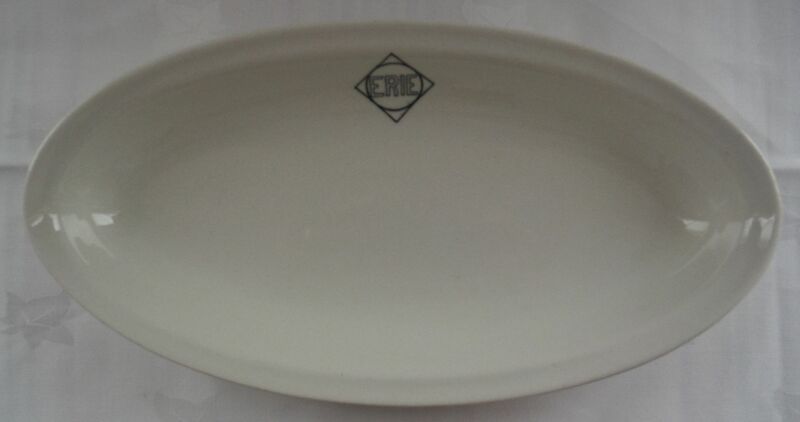 In fact the EL never ordered its own china pattern, so this became the defacto standard pattern of the EL. 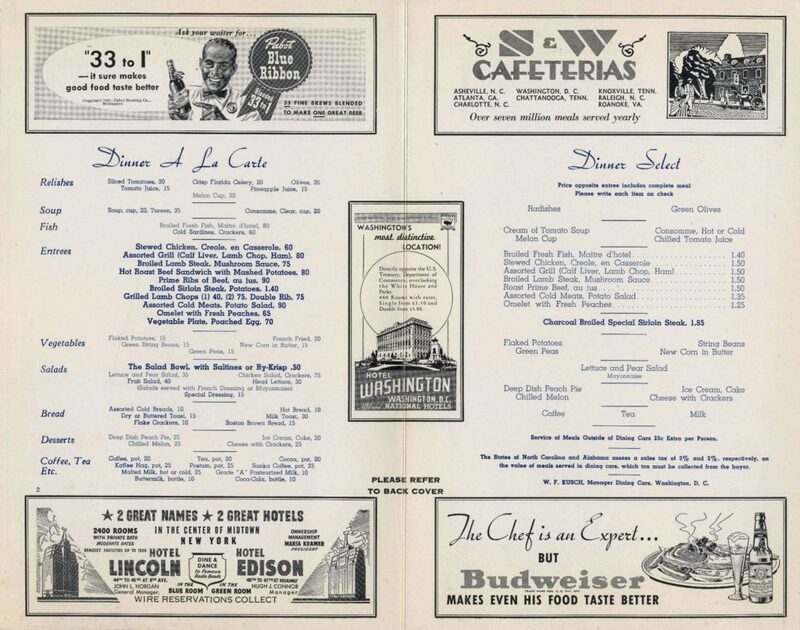 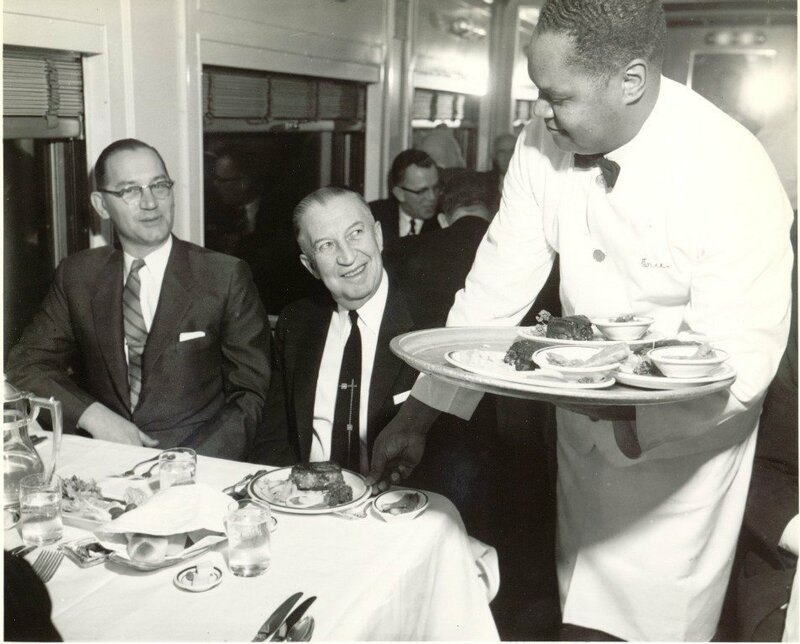 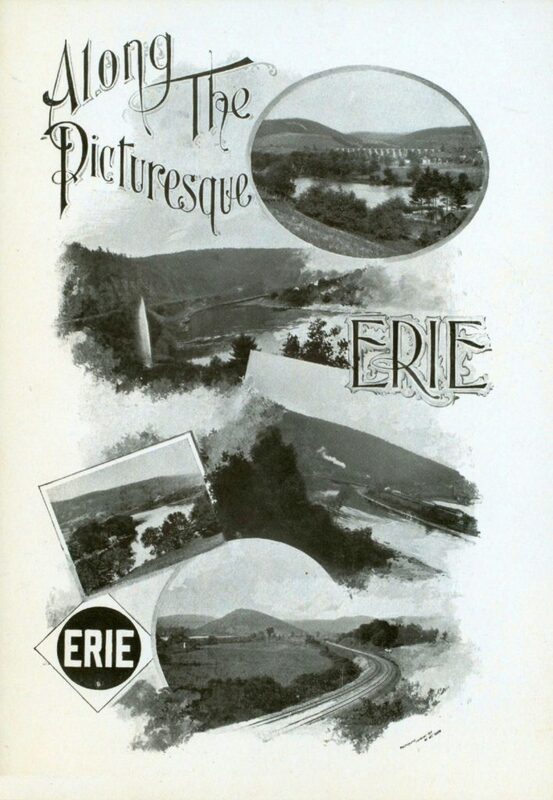 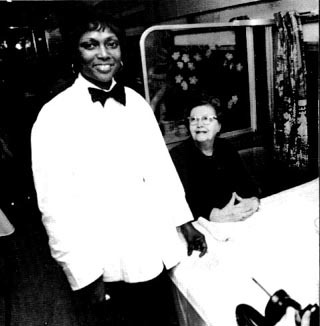 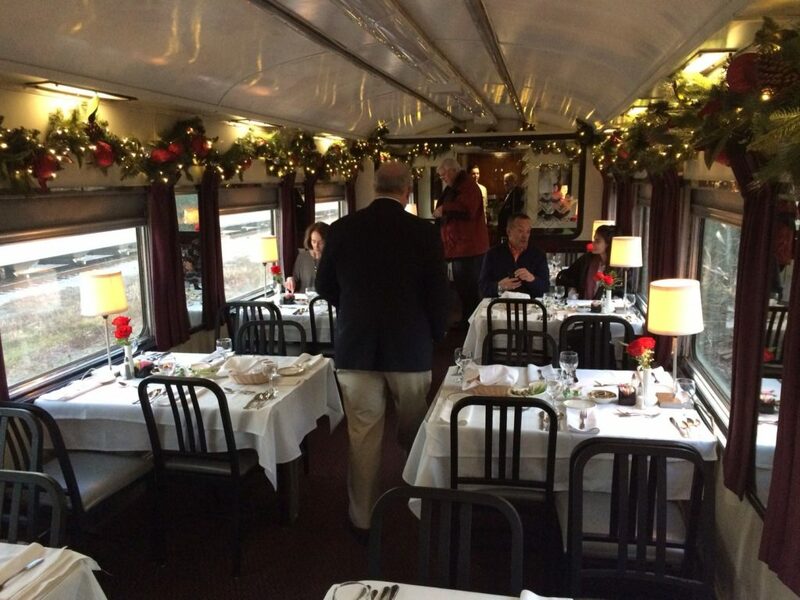 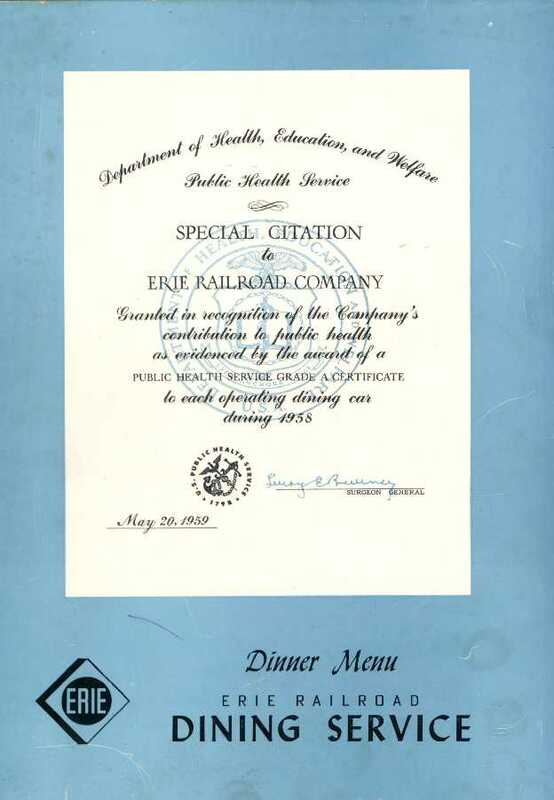 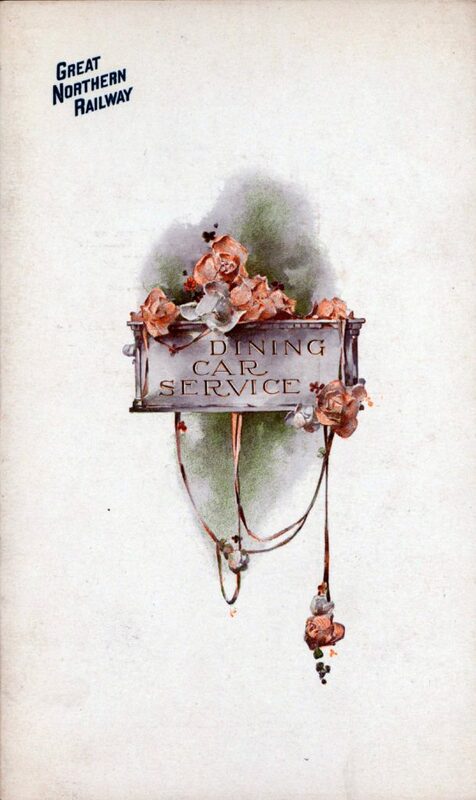 We hope you enjoyed a look at the Erie’s dining car service. 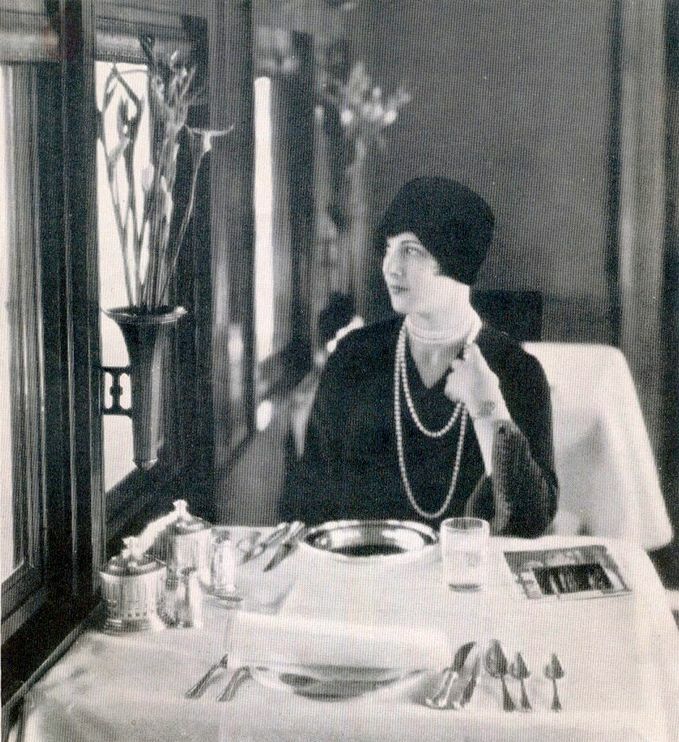 We decided this time to take a look at dining car service on the Great Northern, specifically pre-WWI service. 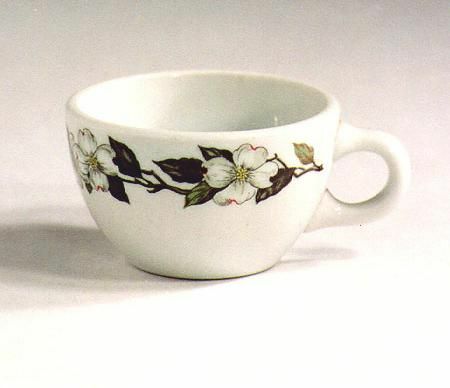 Photo of the early “Hill” china pattern. 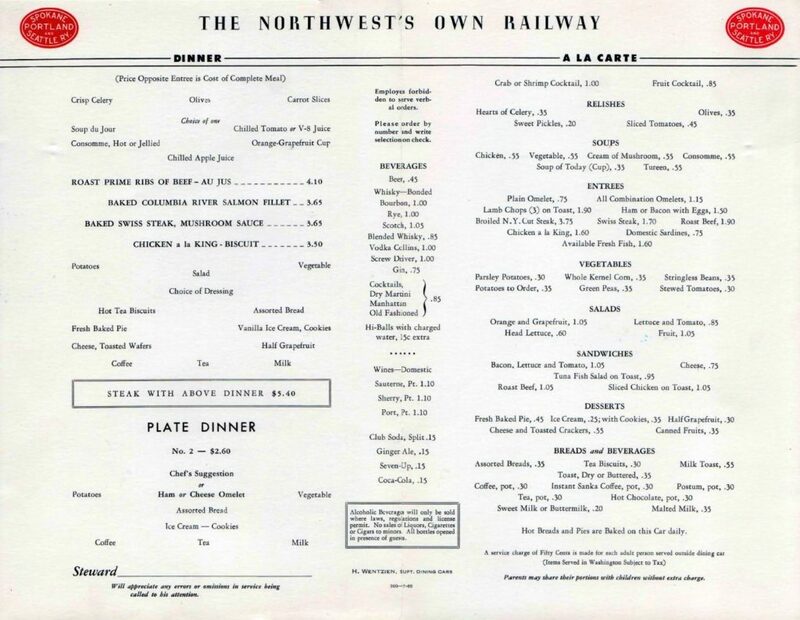 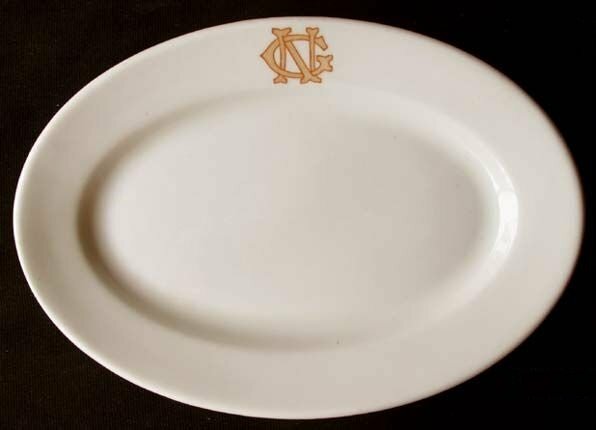 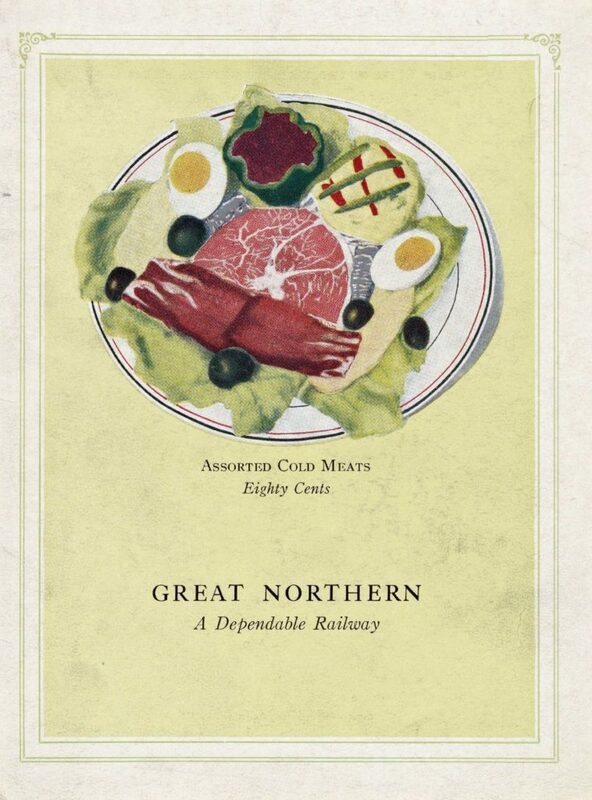 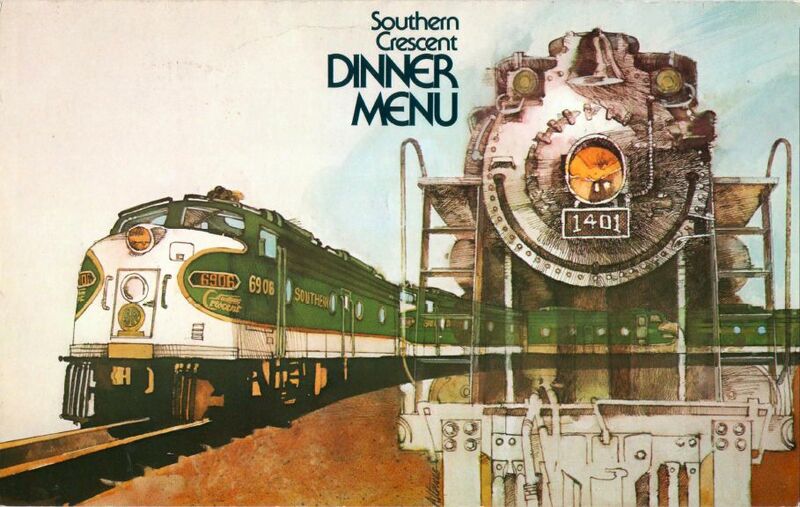 We hope you enjoyed our look at the Great Northern’s dining car service in the early 20th century. 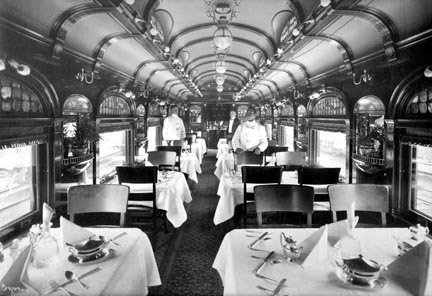 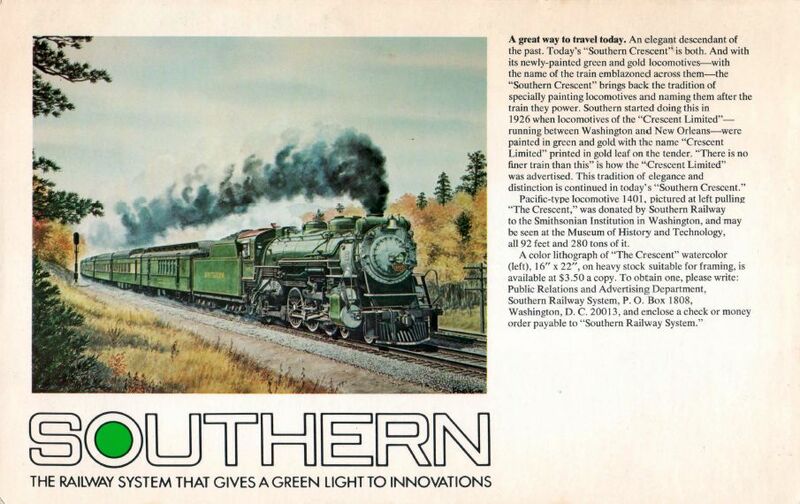 The New Haven probably had the most extensive dining car operation of all the U.S. railroads. 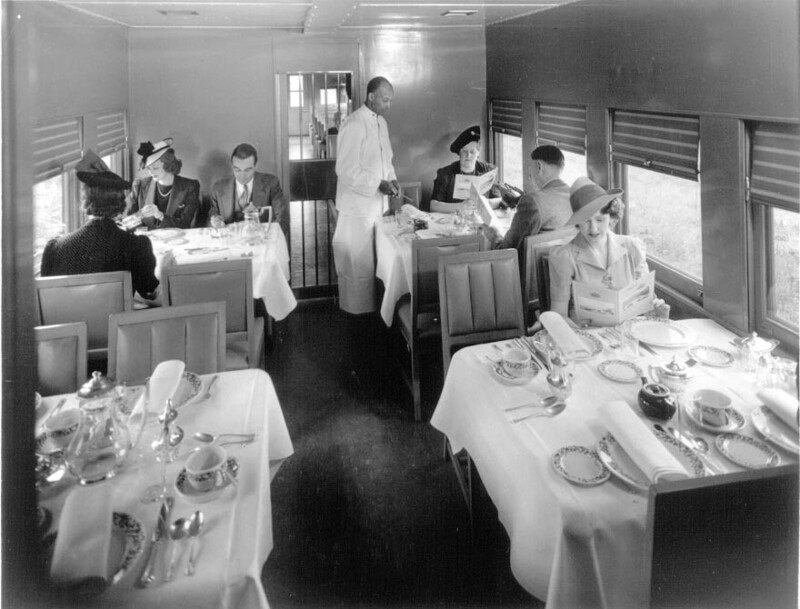 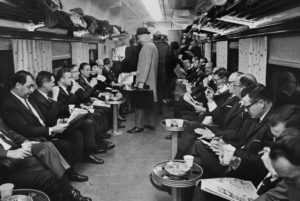 In addition to traditional dining cars, they had their lower cost “grill cars” as well as parlor cars and bar cars on the commuter trains. 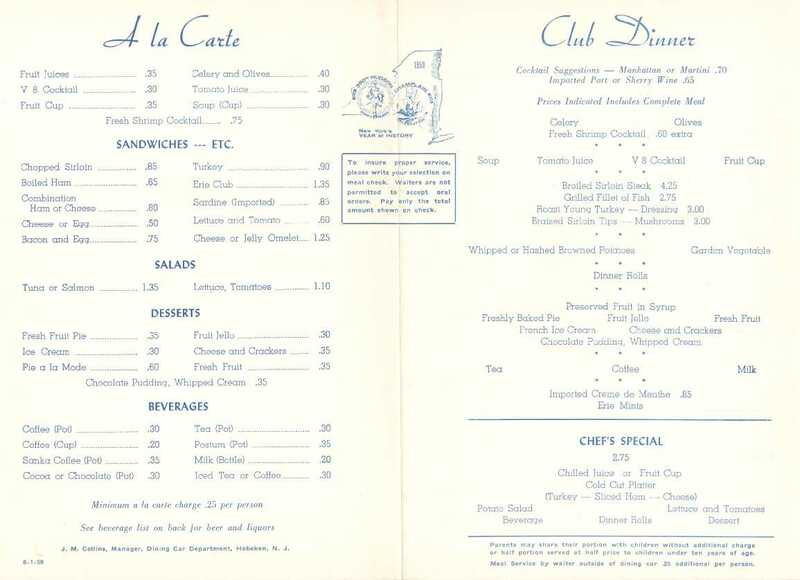 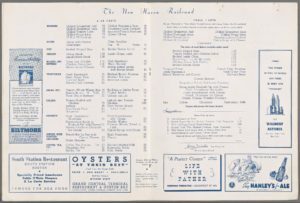 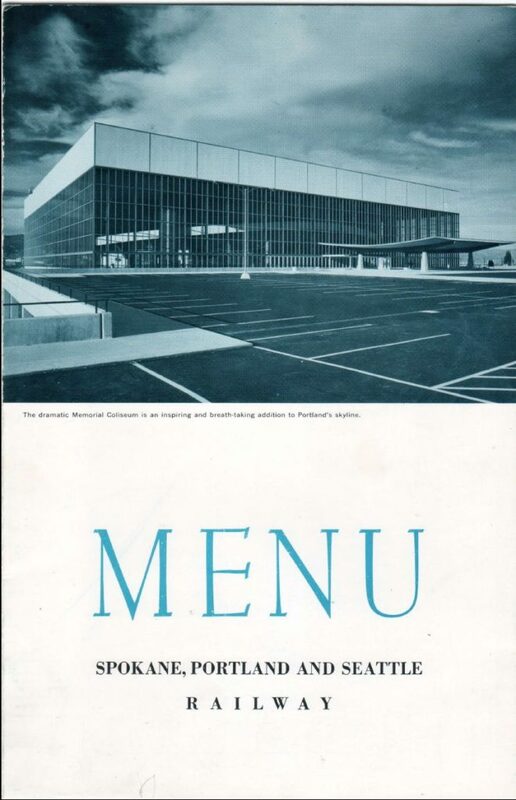 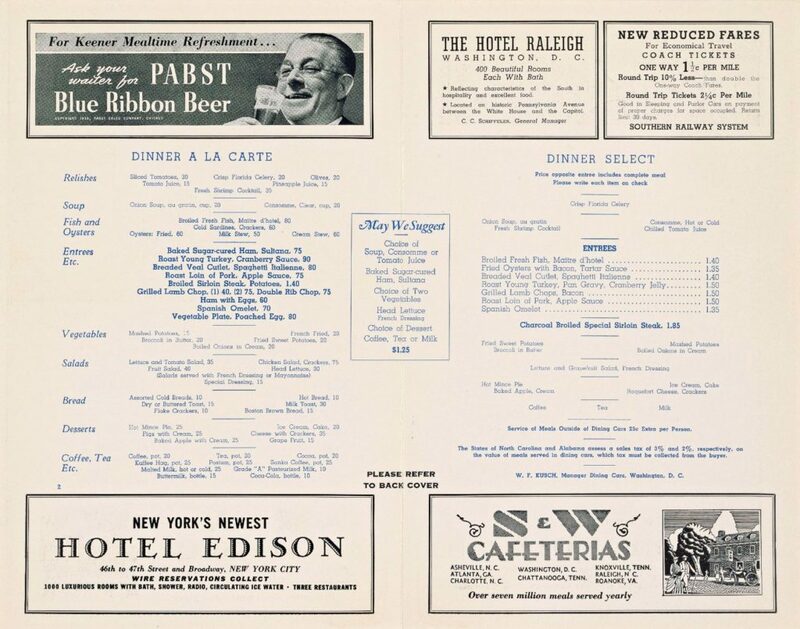 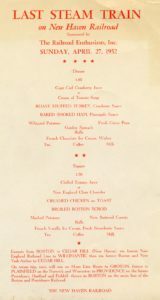 1962 dinner menu – by the mid 1950’s on, most New Haven menus featured ads and tourism guides, mostly to Boston and New York. 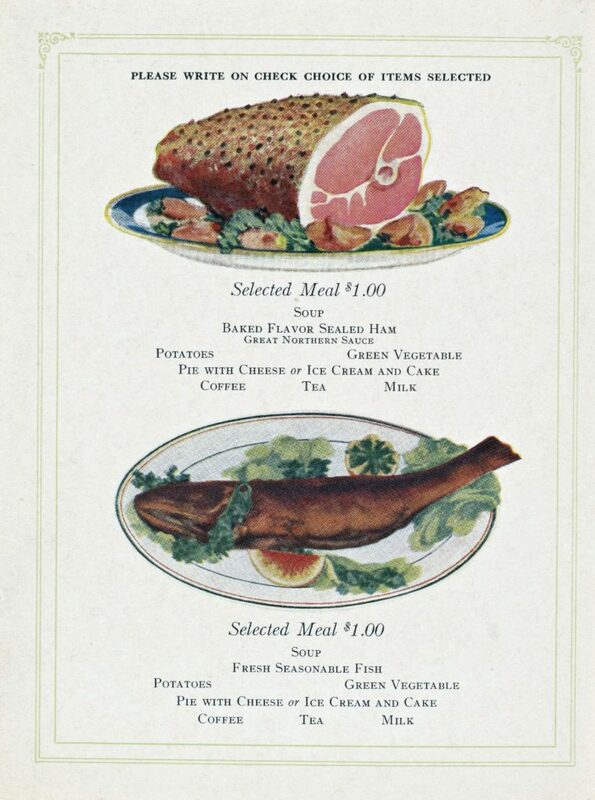 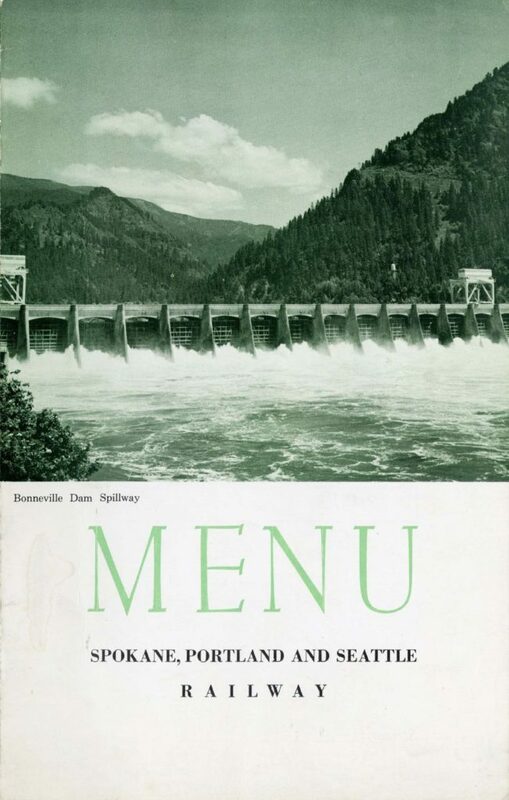 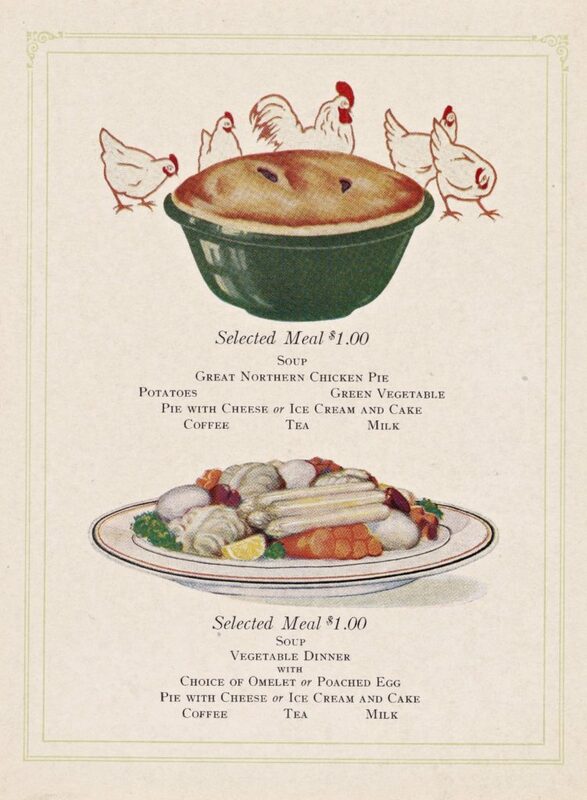 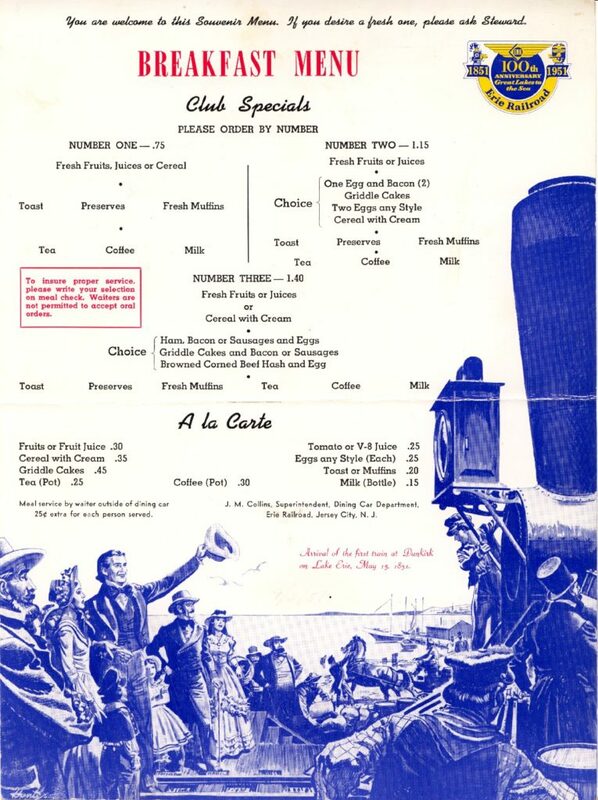 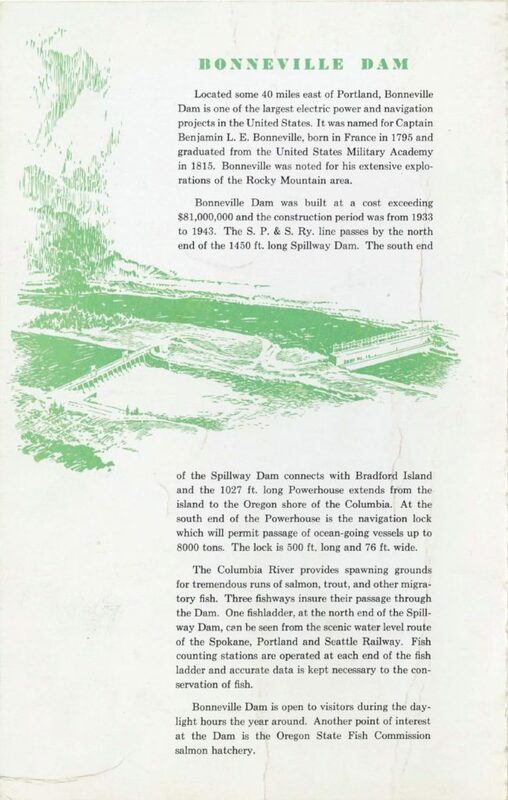 Special menu from 1952 last steam trip. 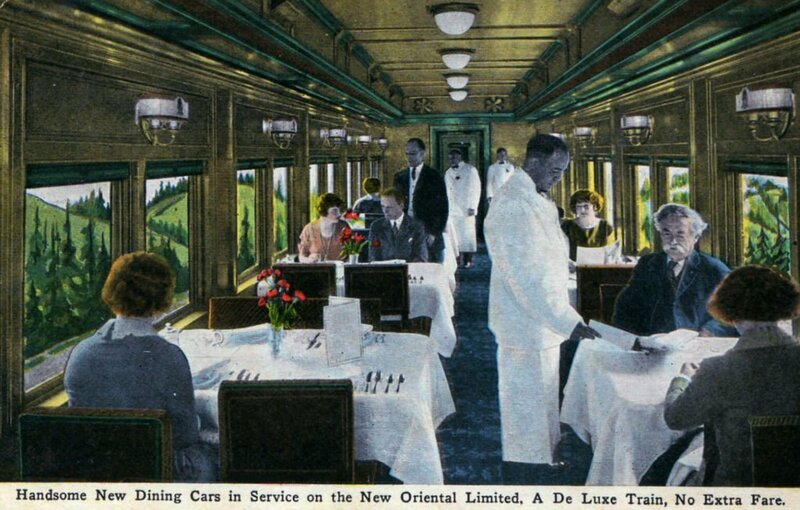 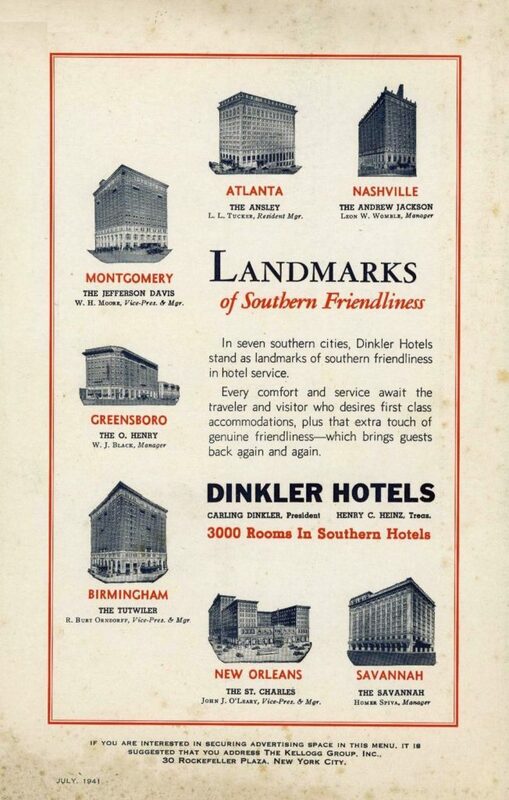 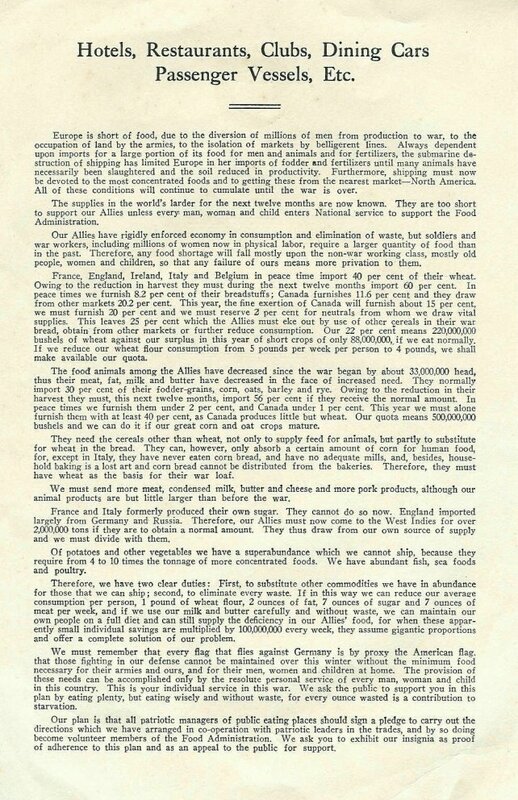 Ad showing the diner, but also promoting the grill cars. 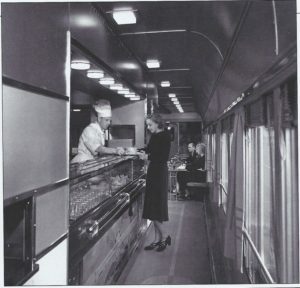 The grill cars featured waitresses. 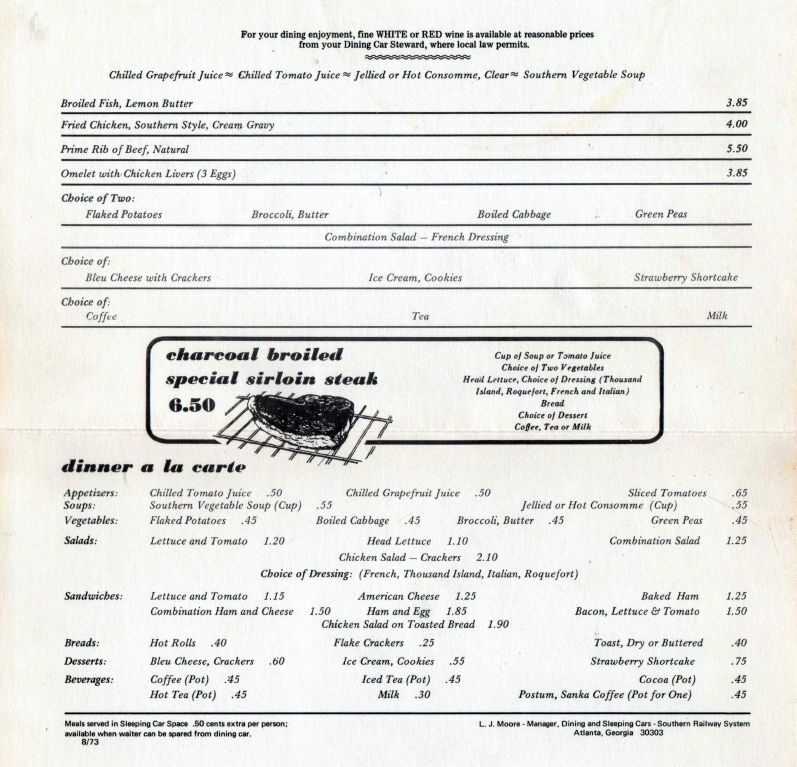 Here, picking up an order. 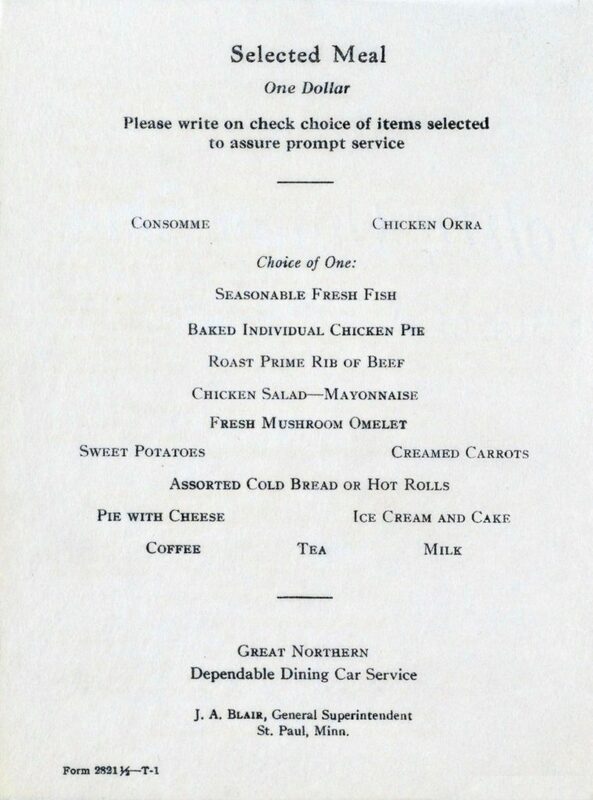 1941 – Thanksgiving meal being served. 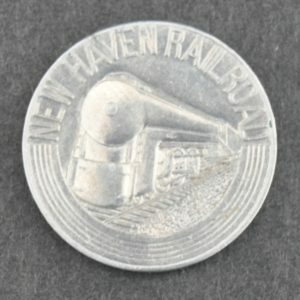 These aluminum coins were given out for free coffee. 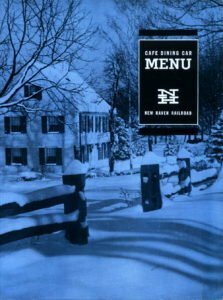 The Phoebe Snow Company offers the very mild roast the NH used. 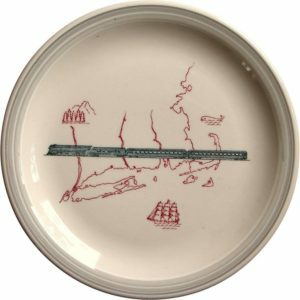 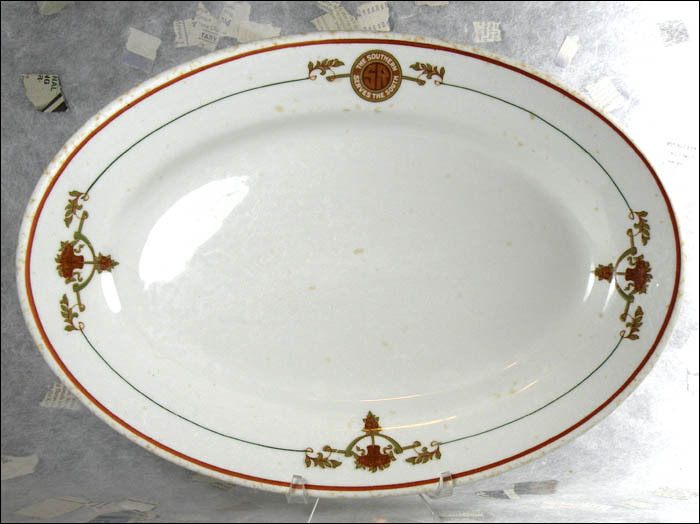 Merchants china – this plate was supposedly used on the grill cars. 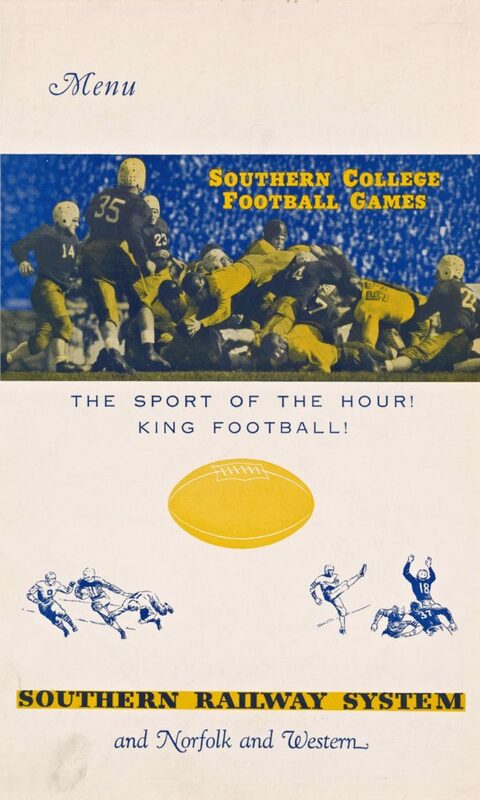 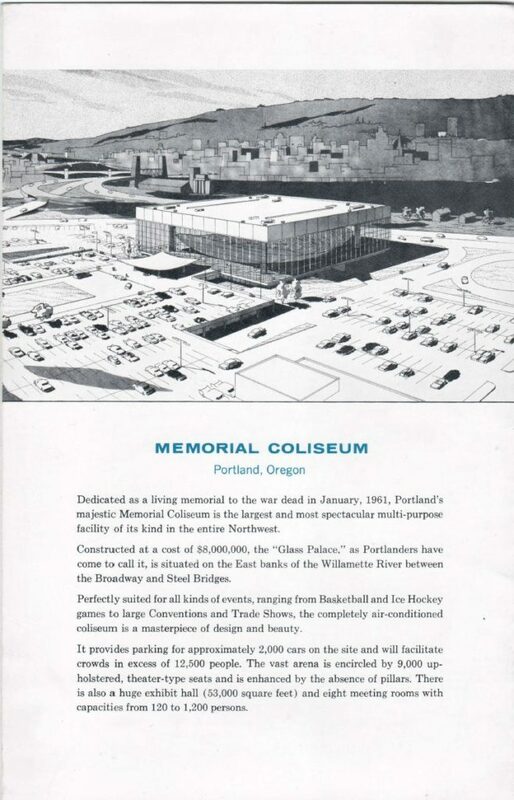 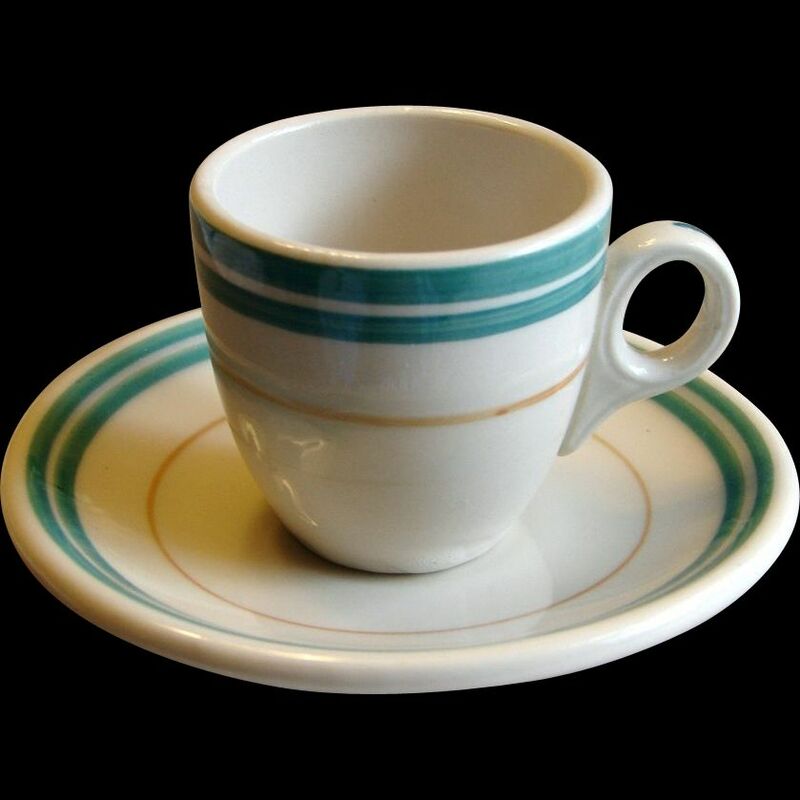 The Platinum Blue pattern was used in the 1960’s. 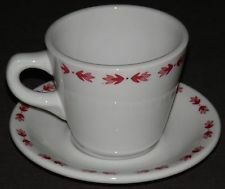 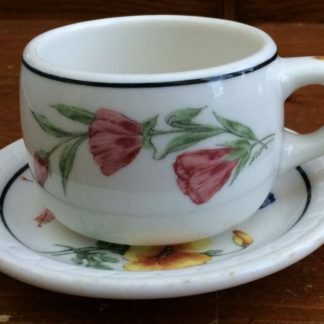 It was interesting because each order seemed to supply a lower quality version of the china. 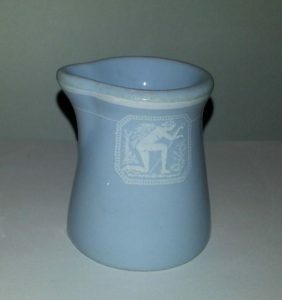 You can find many pieces where the quality of the white transfer art is terrible! 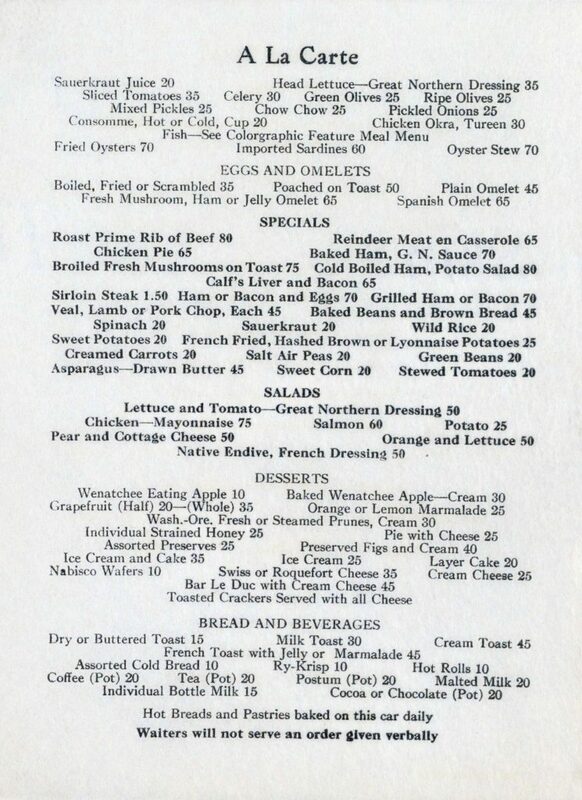 The Baked bean pot. 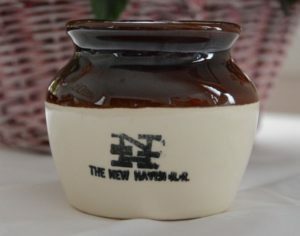 A stock piece where the New Haven added their logo in a haphazard way. 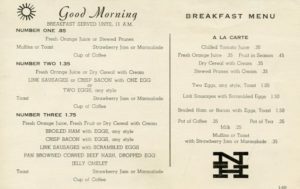 However, I am fond of this piece as I remember it distinctly from my first New Haven dining car experience Labor Day weekend in 1966. 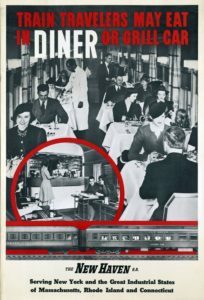 I hope you enjoyed our look at the New Haven dining car operations!